Khaled Hosseini, at one point in his novel, described Kabul as a thousand tragedies per square mile. 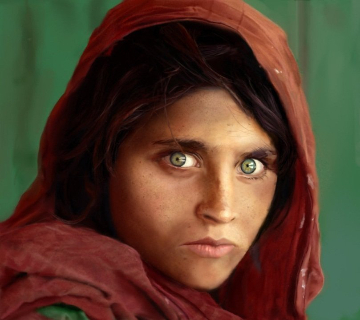 The green eyes of the ‘Afghan Girl’, the iconic photograph that featured on the June 1985 cover of National Geographic, seemed to reflect the impact of Afghanistan’s tragedies. Sharbat Gula’s story – one of unceasing toil and turmoil – is shared by numerous Afghan refugees. 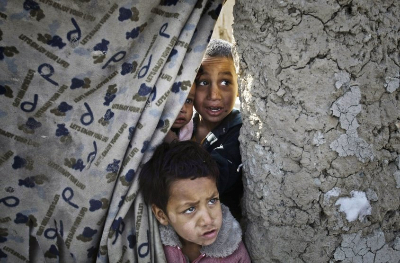 A “forgotten crisis”, their frightening future continues to haunt yet another generation. What is known of Sharbat Gula’s story? Afghan Girl, the photographic portrait of Sharbat Gula, symbolizes trauma and terror Afghanis like her experience and have experienced through more than one generation. She was among the early refugees who have since fled wars and ethnic conflicts in Afghanistan and sought respite in Pakistan. She was six years old when Soviet Union’s bombing killed her parents. Along with her grandmother and siblings, she traversed the mountains to Pakistan and reached the Nasir Bagh refugee camp in 1984. While different accounts of her story agree she fled to Pakistan as a child with family members during the Soviet invasion of Afghanistan, they differ on her age then, if the war killed her parents and on which of her family members she fled with. 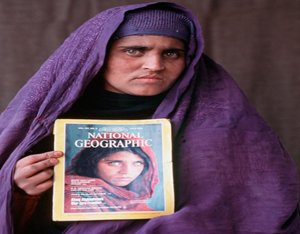 The world knew her as “Afghan Girl” for about seventeen years since she appeared on the cover of National Geographic in June 1985. She was revealed as Sharbat Gula in 2002 when the photographer Steve McCurry, greatly aided by a team from National Geographic Television & Film’s EXPLORER found her. 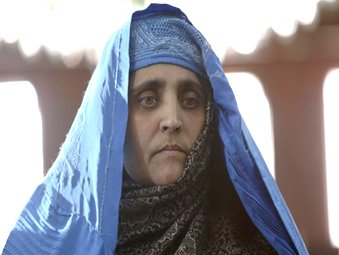 She reportedly returned to her village in the mid 90s and was then residing in the mountainous Tora Bora region. She made news in 2015 when some newspapers reported authorities in Pakistan had cancelled her National ID card and those of two men listed as her sons. She was arrested in 2016 for “illegally” obtaining Pakistani identity papers, imprisoned for 15 days and deported. Hundreds of thousands of Afghan refugees who have been deported by Pakistan share her story or at least a significant part of it. Why is Pakistan expelling Afghan refugees en masse? This forceful expulsion of refugees is a recent development. Over three decades, the Afghan refugee population reached about 3 million. In 2002, Pakistan acceded for a voluntary return of Afghans to their country by signing an agreement with United Nations High Commissioner for Refugees (UNHCR). Since then, Pakistan never forced refugees to return; the repatriation was gradual and voluntary.But it suddenly imposed a six-month-deadline for the refugees to return and this time was harshly rigid. In 2011, a senior Pakistani official said above 90 percent of terrorist attacks in Pakistan could be traced back to Afghan refugees. Pakistan was third largest in number of terrorism-related deaths in countries of the world in 2013. In December 2014, a terrorist attack on a military-run school claimed 132 children’s lives and provided the background for Pakistan’s new counter-terrorism policy – the National Action Plan – which, among other policies included prioritization of registration and repatriation of Afghan refugees. Ill-considered implementation and consequent friction exploded the tensions boiling across the border. Deadly clashes between Pakistan and Afghanistan were followed by accelerated efforts to repatriate the refugees. Counter-terrorism efforts are not the only reason for Pakistan’s expulsion of its Afghan refugees; another motivation is Islamabad’s policymakers’ belief that Afghan government is increasingly turning hostile to Pakistan. 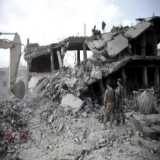 Incidents that have exacerbated tensions between the two countries include the death of Mullah Mansour – former chief of Afghan Taliban – in Pakistan due to a US drone strike. Afghanistan expressed relief at the news of his death but made clear its strong disapproval of Pakistan’s continued sheltering of Kabul’s enemies. Further, Afghanistan joined an India-led boycott – due to increased fracture of diplomatic relations following the Uri attack – of the 19th SAARC summit scheduled in Pakistan. Islamabad sees this as New Delhi’s device to isolate Pakistan. When was the condition of refugees returning to and those in Afghanistan revealed? It’s not only Pakistan; Turkey and the European Union are sending back or negotiating to send back Afghan refugees as well, albeit unlike the mass repatriations from Pakistan. Human Rights Watch also reports that Iran on the other hand, is threatening them with dire choices – fight in Syria or return to Afghanistan. Internal displacement, the result of continuous war over one-and-a-half decade, has led to 300,000 Afghans living as refugees in their own country. Refugees used to basic facilities in their countries of residence will find themselves deprived of these on return to Afghanistan. Kabul, an overpopulated city which lacks the capacity to support such a huge population might be their preferred destination. A Pakistani journalist points out that the indifference from governments, aid groups, or other agencies makes the situation even more hopeless. Pakistan’s sudden hostility when at one time it seemingly welcomed refugees and was the birth land for their children pushed them from a relatively secure state back into uncertainty in Pakistan – the courses students are pursuing may be suspended, hate campaigns against refugees are suddenly resonating widely as has police violence – and war in Afghanistan when they were completely unprepared. 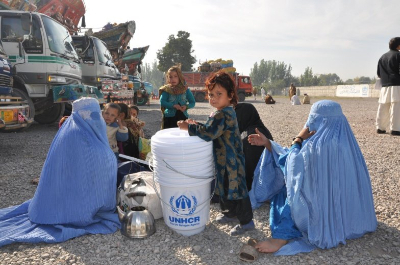 Harsh winter, size of the families, barely any aid from local or international organizations, conflict zones and spikes in violence, undetonated landmines, and Afghanistan’s struggle to handle the huge rise in returnees culminate to inflict on the returning refugees. In 2013, BBC News reported that Afghanistan had, for the 32nd year, remained the largest source of refugees globally and that 95 percent of them fled to Pakistan and Iran. Afghanistan continuously remained a target of war. Citizens fled the country first due to Soviet invasion, then to escape the horrors of Civil War, followed by an exodus during the Taliban rule. 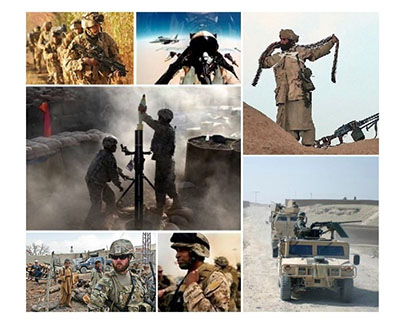 The most recent reason to force out Afghans from their country is Western-initiated invasion - part of the so-called War on Terror - after September 11, 2001 attacks on the United States. Citizens have fled, returned when there is a lull in the war and then been forced out as conflict resurfaced. While the turmoil in Afghanistan has been long, it seems to have become a “forgotten crisis” – international interest has decreased with removal of most foreign troops and Afghanistan is left to fend for itself during its internal crisis, said senior researcher Patricia Gossman in 2015. Deteriorating security and reduced international aid has hit the economy as well. In 2012, Abid Amiri presented a different explanation for the exodus of Afghans in 2011. He said most of the people leaving Afghanistan were young men and among those whose families returned post defeat of Taliban. But with unemployment remaining high, the education system short on capacity, and the economy stuck in a rut, they chose to move out to countries in Europe and Australia for a better chance at building their lives comfortably by pursuing better employment or higher education. But he also pointed out the worsening security situation which re-triggered fear of restoration of Taliban and civil war in the minds of Afghans as the primary reason. More recently however, increased indifference from the international community fostered multiple attacks from Taliban and the government’s struggle became even more apparent.Hazaras – an ethnic group targeted by Al Qaeda and Taliban for being Shia – form a significant part of the fleeing refugees. A UN official said the most intelligent and well-educated Afghans, who held good jobs in the times of US and NATO, sought out Germany as the place they could get back their jobs. Also, as Pakistan’s hostility became strong in 2015, more refugees risked their lives to ride through Iran and Turkey in their hope of making it to Europe. The US also bears responsibility for its silence on the refugee crisis of Afghanistan; choosing only to remove the troops it had instilled. Ahmed Rashid sums it up as The Afghan refugee crisis is the result of a web of more than three decades of wars, invasions, Islamic extremism and multiple dislocations of populations. The person of course is Sharbat Gula and several Afghans like her have stories that overlap with hers; but the image tells a story of its own. The cover carrying her image became an icon of the magazine. Her green eyes and haunted look captivated the world in different ways. For some people, she evoked compassion and they wanted to reach out to her – Steve McCurry the photographer spoke of people wanting to send her money, people wanting to adopt her and even men wanting to find and marry her, all of who sent thousands of letters to National Geographic. For some people, the image inspired them to take an interest in what was happening in the Afghan world; her face became a disturbing but magnetic symbol of war in Afghanistan and the refugee crisis it spawned.“People volunteered to work in the refugee camps because of that photograph”, said McCurry. For the Bush administration, it was a propaganda tool to draw support for the war on terrorism. For Afghans, McCurry said the photograph made them incredibly proud as the girl is poor but shows great pride, fortitude and self-respect. For National Geographic, it led to a quest after seventeen years to find out the name given to the face and as a dedication to her, the establishment of the Afghan Girls fund which aimed to educate girls and women and later expanded to become the Afghan Children’s Fund. A creator was inspired by this photo to depict another horror story from Afghanistan. Every now and then a photo comes along and is said to shake the world.But Sharbat Gula’s most recent images highlighted how fast and easily the world forgets, or remembers the image, but forgets the crisis that was instrumental in making that image unforgettable. 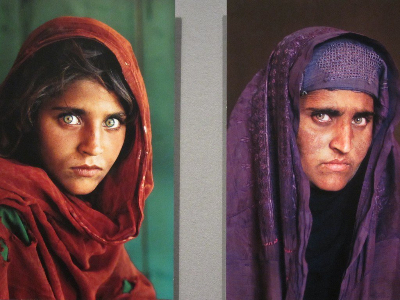 How does Sharbat Gula view the Afghan Girl? Gula, now sick and frail, lives with her five-year-old son and three daughters in Kabul, where she says she wants to live a normal life after years of hardship. She is angry on Pakistan and still in disbelief at the way she was uprooted from her home of so many years. Afghan government has treated her well post return.She was received by President Ashraf Ghani in the presidential palace, and she also met former President Hamid Karzai. Beyond the symbolism of personally receiving the most famous Afghan refugee, the policy makers in Kabul have to worry about accommodating the thousands of Afghans being sent back by Pakistan. Eye color – determined from the color of the iris – depends on the melanin concentration in the iris pigment epithelium (present at the back of the iris), the melanin content within the iris stroma (present at the front of the iris), and the cellular density of the stroma. It also depends on the scattering of light based on frequency by the turbid medium of the stroma. For people with light-colored eyes, the lighting conditions are also a strong determining factor. Iris pigmentation varies from brown to black – no green or blue pigments are present in the iris or fluid within the eye. The eyes take on blue, hazel or green colors due to a phenomenon known as Tyndall scattering. Brown and black irises have high concentration of melanin and absorb the light. When melanin is absent, blue wavelengths which have a higher frequency are scattered and reflected back into the air. Blue iris is therefore an example of structural coloration – the material appears to take on a color despite possessing no pigmentation of that color. Green eyes have low to moderate melanin concentration in the stroma which results in an amber or light brown pigmentation. When light undergoes scattering due to low melanin concentration the brown-blue combination causes the iris to take on a green color. Like blue iris, it is also an example of structural coloration. The yellow pigment lipochrome is present in a person with green eyes. The interactions of genes which determine eye color are yet to be completely unraveled.